Founded in 1853, Manhattan College, a private, independent coeducational institution, offers an exceptional college education enriched by Lasallian Catholic values. Our celebrated faculty, small classes, and exciting internships prepare ourstudents for a lifetime of achievement in a suburban campus that’s located only minutes from Midtown Manhattan. 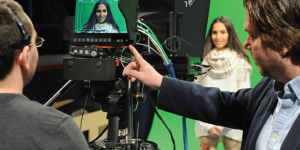 Manhattan College offers more than 40 majors within the College’s six schools: Business, Continuing and Professional Studies, Education and Health, Engineering, Liberal Arts, and Science. The College’s nationally acclaimed Engineering and Science programs will provide you with the revolutionary knowledge and resources you need for a successful career. At Manhattan College, your education is both practical and innovative. In addition, a student-faculty ratio of approximately 12:1 allows our students to receive individual attention and support from distinguished faculty who are renowned in their fields. Coupled with our small class sizes,our students thrive in a tailored learning environment that promotes personal and professional achievement that lasts a lifetime. An education from Manhattan Collegewill open doors to your future. 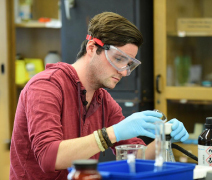 Byproviding our students with an exceptional education and access to cutting-edge resources, our graduates have gone on to create an essential valve for the artificial heart and devised the key mathematical formula for oxygen transfer in surface waters. The options in health and medicine at the College include Allied Health, Biochemistry, Biology, Chemistry, Environmental Science, Environmental Studies, Exercise Science, Nuclear Medicine Technology, Physical Education, Pre-health, Psychology, Radiation Therapy Technology, and Radiologic Technology. Our graduates gain admission to leading doctoral programs and medical schools. In fact, Manhattan College is one of a select number of undergraduate colleges with a chapter of Phi Delta Epsilon, an international medical fraternity. Furthermore, our research programs and facilities have received funding from the National Science Foundation, the Pew Charitable Trusts, the Howard Hughes Medical Institute, and other prestigious sources. Internships at labs, hospitals, health facilities, and schools round out a student’s education and create opportunities for networking with alumni throughout the Tri-State Area. For those studying Radiation Therapy Technology, for example, the clinical experience is central to the program. Students complete 16 credits of clinical internship courses, totaling approximately 222 full workdays, with one of the College’s cutting-edge affiliate medical centers in the New York City metropolitan area. An ideal place to live and learn, Manhattan College offers students the best of both worlds: an intimate, close-knit campus located in New York City’s suburban Riverdale community and easy access to one of the most exciting cities in the world—New York. • All three of Manhattan College’s professional schools—Business, Education and Health, and Engineering—are nationally accredited. • The School of Business is one of 789 institutions throughout the world accredited by the Association to Advance Collegiate Schools of Business (AACSB International). • 18 alumni are members of the prestigious National Academy of Engineering, an impressive number for an institution of Manhattan College’s size. • Manhattan College is one of a few American colleges to have chapters of all five of these national honor societies: Beta Gamma Sigma, Kappa Delta Pi, Phi Beta Kappa, Sigma Xi, and Tau Beta Pi. • Of more than 4,000 colleges and universities in the United States, Manhattan College is one of only 351 with Division I athletics. • Manhattan College is one of only 182 colleges founded in the United States before the Civil War that is still surviving. • U.S. News & World Report ranks Manhattan College 15th out of 138 in the Best Regional Universities—North category of its 2016–2017 “Best Colleges” list. This is the 10th year in a row the College has placed in the regional top 20. • U.S. News & World Report ranks Manhattan College eighth among 52 regional universities that are attractive colleges for veteran students. • Brookings ranks Manhattan College ninth out of more than 7,000 two- and four-year schools in an analysis that examines how well schools prepare students for successful careers. 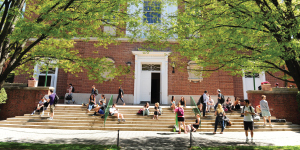 • Money magazine ranks Manhattan College #3 on its list of the “50 Colleges That Add the Most Value,” which evaluates quality of education, affordability, and career outcomes.